Trumbull College is located at 241 Elm Street in New Haven and is one of the smallest residential colleges at Yale. It is also by far the most picturesque, a granite fortress that looks just the way people think Yale is supposed to look, with Jacobean chimneys, gothic arches, and a Norman dining hall. On Elm Street between York Street and the Rose Walk, defined on the north by the wall of Sterling Library’s most majestic fenestration, we find ourselves at the center of Yale, both physically and in spirit. Inside, we’re clustered cozily around three courtyards: Main Court, spacious, grassy, and a wonderful echo chamber for the carillon of Harkness tower; Potty Court, playful, sometimes raucous, indecorously named for its most conspicuous gargoyle who sits on a latrine and gets painted every year by the graduating class; and Stone Court, quieter, serene, austere. There’s a small fourth courtyard at the entrance to the master’s house, so photogenic it tends to show up on postcards. James Gamble Rogers, who designed nine of the twelve residential colleges, on its completion in 1930 considered Trumbull – modeled after King’s College, Cambridge – his masterpiece. 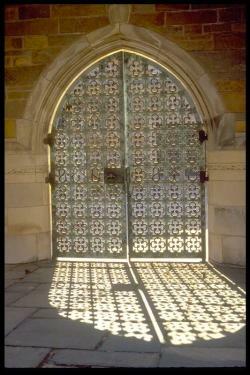 Our motto: Fortuna favet audaci – Fortune favors the brave. 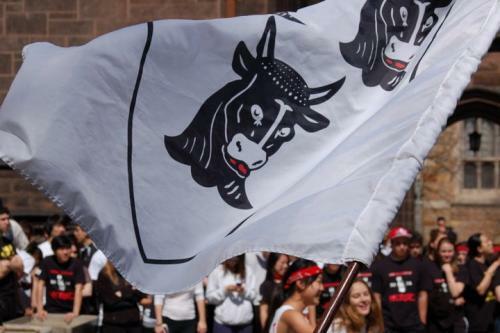 Trumbull has the best dance event at Yale (and we’re generous enough to let you in for a small fee). At Pamplona, the Bulls are let free to run amok, while during the Rumble in Trumbull Trumbullians combat with massive foam gloves. The TrumCrier wears bull horns and proclaims, to the clinging of forks against cups that, at 6 o’clock in Trumbull, alllll is welllll. All is well, indeed, when one is sitting on top of the world. No other college can claim to be quite so loved as Trumbull – the ultimate sacrifice is evident in Sterling giving its wall to serve as Trumbull’s fourth. The hidden courtyards that everyone claims exist at Yale? Undoubtedly, people are referring to Trumbull’s main court. The unofficial headquarters of the undergraduate drama that isn’t happening at the Yale Dramat, Nick Chapel has played host to countless comedies, tragedies, senior projects, and musicals. The only residential college theater for most of Yale’s history, Nick Chapel is constantly in high demand and serves as a constant source of entertainment for Trumbull students right in their own basement. Moo-rah, moo-rah, we’ve got big bulls? When spoken through the genteel lips of classy Trumbullians, the words almost seem dignified. Almost, but not quite. And perhaps that’s the fun of it. 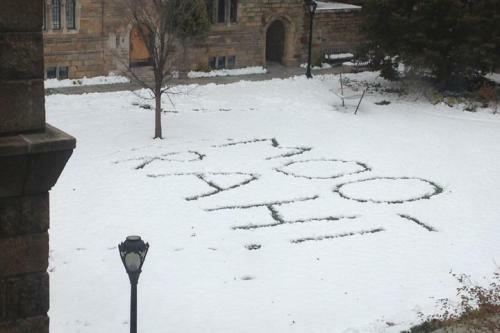 The third of Trumbull’s courtyards, Potty Court is Yale’s only courtyard with a mascot and a distinctive title. The Courtyard’s name derives from a modern rendition of The Thinker a whimsical statue of a figure sitting on a toilet that adorns the rooftop facing Sterling library. 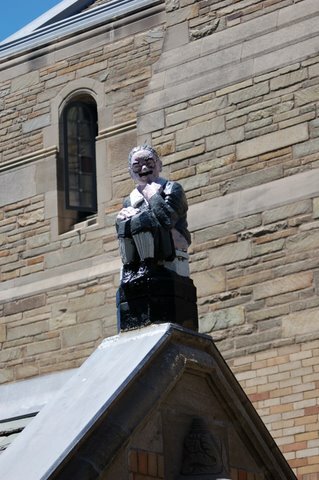 One only wonders whether this spectacular gargoyle banned from Sterling will ever earn its rightful place on the cover of the “Pictures of Yale” books. Regardless, Mr. Potty has been loved by the adoring fans who attend Potty Court’s legendary parties. Snap a photo of him now – he may not be the same tomorrow. Each year, Mr. Potty has been given a makeover, courtesy of Trumbull’s graduating class. Recent versions include, but are not limited to, Spiderman and a tarred and feathered gentleman.